Patients with morbid obesity are complicated with metabolic diseases and have a high incidence of non-alcoholic fatty liver disease (NAFLD), including non-alcoholic steatohepatitis (NASH). 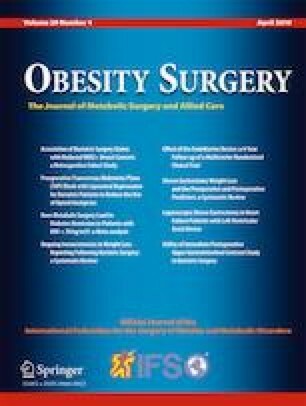 We report on a follow-up study of a cohort included 102 obese patients (55 males and 47 females, mean age 42.9 ± 10.6 years) undergoing bariatric surgery for the management of morbid obesity. Abdominal computed tomography was performed before and 1 year after surgery. Anthropometric and biochemical measurements were performed at 1, 3, and 5 years after surgery. The mean body mass index (BMI) of the NAFLD patients improved from 42.5 ± 8.3 kg/m2 to 28.5 ± 6.9, and 29.1 ± 5.7, 29.7 ± 5.5 kg/m2 at 1, 3, and 5 years, respectively. The liver fat accumulation and visceral fat areas were significantly improved at 1 year after surgery. The decrease in the BMI, waist-hip ratio, body fat percentage, and basal metabolic rate remained decreased for at least 5 years after surgery. Blood test findings including AST, ALT, γ-GTP, uric acid, albumin, CRP, HDL cholesterol, LDL cholesterol, triglycerides, and homeostasis model assessment insulin resistance (HOMA-IR) were also still improved at least 5 years after surgery. Bariatric surgery is useful for ensuring the long-term treatment of NAFLD/NASH in morbidly obese Japanese patients. Bariatric surgery is a therapeutic option for patients resistant to conventional treatment. The online version of this article ( https://doi.org/10.1007/s11695-018-03641-2) contains supplementary material, which is available to authorized users. This study was approved by institutional review board (IRB) of both Yotsuya Medical Cube and Gunma University Hospital.